The Chamber of Secrets? Really, I don't know how J.K. Rowling's sub-conscious mind can come up with such blood-curdling, yet imaginative ideas. And, after the first movie and the great "Battle Chess" scene, there was no way that anyone was going to miss this one - and it doesn't disappoint. In Harry Potter and the Chamber of Secrets, Rowling continues the formula for success that was outlined in the first book (and movie) and was used for several more movies after that, just quietly. That is, Harry battling the Dursley's before a strange character or event appears to change matters. In the Sorcerer's Stone it was the snake at the zoo and the owl post. In the Prisoner of Azkaban we see Aunt Marge "blown up" and the arrival of the "The Grim". And in the Chamber of Secrets we see the emergence of Dobby (more of Dobby later) and a flying car - a Ford Anglia no less! Interestingly, Rowling had a friend when she was a young teenager who would come to pick her up in a Ford Anglia. From then on she always got the feeling of freedom whenever she saw, or sees, a Ford Anglia, and that's how it ended up in the story, though now it's Harry's freedom! But back to Dobby. Dobby has become one of the most loved characters within all of Potterdom but I must say he took a while to "grow" on me. Although he tries to do the right thing in the Chamber of Secrets and protect Harry Potter from the forces of evi,l he is rather a bumbling fool. His questionable strategic skills lead Harry into all sorts of trouble. He is so inept in his efforts to save Harry that he almost gets him killed on several occasions. But what a clever piece of characterisation by Rowling. Dobby elicits extreme emotion in most readers/viewers of the story. She creates great tension via Dobby's exploits and thus draws the reader further into the story - genius! When I examine my own initial dislike of Dobby I realise that very dislike (which turned to eventual liking of the character) drew me further into the story because I really wanted to see how things turned out. And in the end I did cheer for Dobby when he gained his freedom via Harry's ingenuity with the sock. Another one of her creative magical objects that "leads" us further into the story is Tom Riddle's diary. Tom Riddle, of course is Voldemort before he became the most dangerous dark wizard of all time. By the use of his diary, which is in fact a Horcrux, Riddle is able to exert his influence over the young, inexperienced and naive Ginny Weasley. Indeed, he actually gets her to open the long forgotten Chamber of Secrets, created by Salazar Slytherin, wherein the fearsome monster, a huge basilisk (snake) lives. Many years before it was Tom Riddle who blamed Hagrid for bringing the monster into the castle and Hagrid was banned from becoming a wizard. It was only the good nature and influence of Dumbledore that sees Hagrid retained at the school, though in a diminished responsibility of "Keeper of Keys and Grounds at Hogwarts." Ginny Weasley was "given" Riddle's diary in the first place by Lucius Malfoy when he slipped it into her book bag in the bookstore. It's the first time we see Malfoy and his ugly demeanour but again, great writing by Rowling. You cannot have a great story if all the characters are good. In essence there is no light without the dark and vice-versa. It's just the natural law of nature and balance and Rowling uses it spectacularly well with her interesting and stimulating characters. And then there's the vainglorious Gilderoy Lockhart who, by means of certain charms, hoodwinks the public into adoring him. He is, in fact, an excellent way of injecting humor into the story that is quite dark in parts, especially for children. But even six year old's can see through this phoney and it's great to watch his incompetence unfold as the Chamber of Secrets story proceeds. One of the scariest monsters ever seen in a children's book or movie is the Basilisk. The scene in the movie where Harry is up against the metal bars and the basilisk is just inches away from him is actually quite scary. I can see why many children were really frightened in the cinema and why they had nightmares for weeks later. But given the choice of including that scene or deleting it I'm all for including it. It makes the movie so much more "edgy" and adds "gravity' to the film considerately. And then there are those spiders! Talk about nightmares!!! But again, without those creatures the story would be a lot less enjoyable. I really believe without the danger and tension the creatures create the story has less credibility and appeal to both girls and boys alike. In fact, I would say girls are even more impressed by such creatures than boys in many instances. I remember some years ago now when one of my class members in Year 5 found the movie trailer to Sleepy Hollow on the net and played it to the class when I was out of the room momentarily. This is the movie starring Johnny Depp and is about the Headless Horseman. Well, I couldn't stop the girls asking me questions about this movie for weeks after until I had to ban them from any further questions under threat of detention. Go figure! Anyway, I digress. 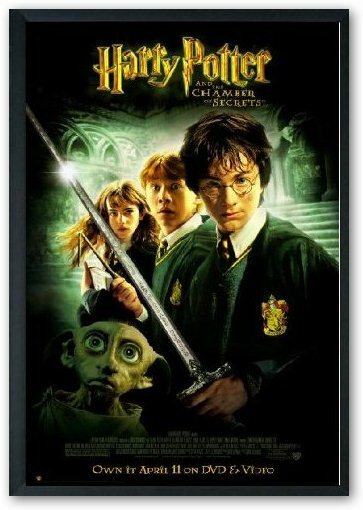 In Harry Potter and the Chamber of Secrets J.K. Rowling has created a wonderful, yet very scary, story for children and adults alike and I highly recommend both the book and film. If you are perhaps one of the very few people in the world that hasn't read the book or seen the movie go to it!